a study claims the maximum temperature over the northwestern Himalayas is increasing at a much faster rate than the minimum temperature. Another study claims it is just the opposite for most of the northern hemisphere, where the minimum temperature is rising faster than the maximum temperature. 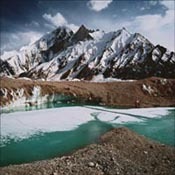 Change in temperature affects crops glaciers and natural vegetation especially a rise in the minimum temperature. "It has been observed that increase of minimum temperature has greater effects but more study needs to be done on this," says A P Mitra honourary scientist at Delhi-based National Physical Laboratory. Going by this Shimla Srinagar and Leh--places where the study was conducted--will not be severely affected. However not all scientists agree. Rise in the maximum The study, carried out by the Department of Geology, Pune University, and the College of Military Engineering, shows a rise in mean temperature in the northwestern Himalayas by 1.6c in the last century, with winters getting warmer at a faster rate. The average rate of rise of maximum temperature is about four times higher (3.2c) than the minimum temperature (0.8c), the study says. The paper was published online on February 15 in the journal Climate Change. "Diurnal temperature range has also shown a significant increasing trend, which may be due to rise in both maximum and minimum temperatures, with the maximum increasing much more rapidly," says the paper. This is in contrast with other mountain ranges like the Alps and the Rockies where minimum temperature has increased at a much faster rate, the paper adds. But some scientists do not agree. "We have found significant increase in minimum temperature and increase in clouds in north India in general. Aerosols may have a very big role to play in this. The paperhas been sent for publication," says S K Das, an atmosperic scientist of iit Delhi. Rise in the minimum The other study has found that minimum temperature has increased three times more than the maximum temperature during 1951-90 (from 0.84c to 0.28c). This study, published in the American Meteorological Society, was conducted over half of the northern hemisphere and about 10 per cent of the southern hemisphere. It also says the decrease of the diurnal temperature range is approximately equal to the increase of mean temperature. The paper attributes the decrease in the daily temperature range partially to increase in cloud cover. It points out that a large number of atmospheric and surface boundary conditions are shown to differentially affect maximum and minimum temperatures. It also says there may be links between changes in diurnal temperature range and anthropogenic increases in sulfate aerosols, greenhouse gases, or biomass burning. Rise in minimum temperature affects crops significantly. A paper published in the Proceedings of the National Academy of Sciences in 2004 (Vol 101, No 24), showed there is a close link between the rise in minimum temperature and fall in yields. The study, conducted at the International Rice Research Institute, Manila, showed grain yield declined by 10 per cent for each 1c rise in minimum temperature, whereas the effect of maximum temperature rise on yield was insignificant. Vishwas Kale, the lead author of the paper, however, said they are yet to study the overall impact of the difference in maximum and minimum temperatures. "There are so many factors that finally bring about the effects that it is not possible to distinguish the effect of any single type of change. Nature has its method of balancing changes. Effects take place when the changes cross the threshold limit up to which nature can tolerate. We have not studied all this factors and hence cannot predict the difference in the effects," he said.